ESPN College Gameday analyst Lee Corso spared no expense in making the big reveal of his pick for Saturday’s Michigan-Notre Dame game during their live episode on the campus of Notre Dame at South Bend, Indiana. It took a few seconds for people to understand what was happening, as Corso’s face was covered as he wore a dark red and black cloak and waddled out onto the set. 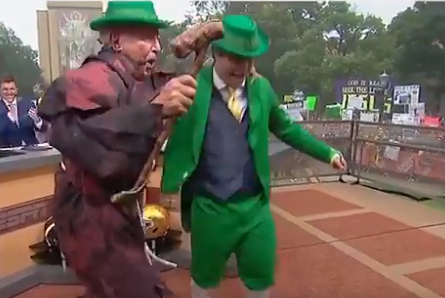 However, Kirk Herbstreit figured out that Corso was dressed as the Hunchback of Notre Dame, which signaled that he was picking the Fighting Irish to beat the Wolverines. The Irish mascot joined Corso on stage, gave him a green top hat, and they danced an Irish jig together. It’s all in good fun. Moonlighting as a blogger to pursue my interest and enjoyment of sports. Former high school and Division I athlete (now a “retired” family man) that loves watching and discussing all sports. Follow me on Twitter (@HoldoutSports) and like Holdout Sports on Facebook.